Hike for Life is partnering with Dallas March for Life and inviting you to do the same! In addition to marching for life in Dallas on January 19, you can also sponsor the March, or be sponsored, to not only help defray the costs of this incredible public witness, but also raise funds to support pro-life ministry throughout the Dallas / Fort Worth area. Click here to sponsor the March or register as a marcher. 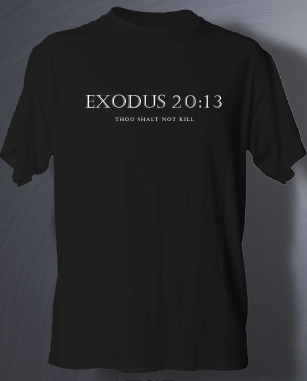 A donation of at least $25 or more includes an Exodus 20:13 t-shirt to show everyone where you stand on life before, during and after the March! 10:00 a.m. Bilingual Roe Memorial Mass at Cathedral Shrine of the Virgin of Guadalupe, celebrated by Bishop Farrell and diocesan clergy, with homilist Fr. Zach Webb and music led by Dave Moore. 12:00 p.m. Dallas March for Life from Cathedral Plaza to ecumenical Rally outside the Earle Cabell Federal Courthouse, where Roe v. Wade was first filed in 1970. What started in Dallas must end in Dallas!